The Horse Latitudes are an area in the Atlantic Ocean where the trade winds died which would stall early Spanish ships sailing to the New World. 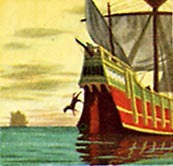 To lighten the ships, the sailors would throw heavy cargo overboard to lighten the ships load, which would allow the weak sails to pull the ship out of the doldrums. This included funiture, crates of dishes, and even canons. When particular areas were still too calm, they were forced to toss over their frightened horses into the sea. The legend is that the horses would swim after them for miles before they drowned, and the superstitious sailors would hear the horse screams in their haunted dreams for the rest of the voyage. 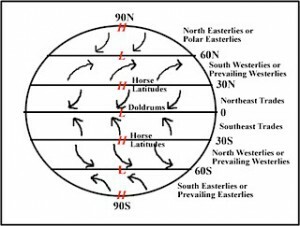 Interesting side trivia, this weather phenomena occurs between 30 and 35 degrees north and south of the equator. The air often sinks in these regions and most of the major deserts around the world can be found in this band. Another (probably unrelated) curiosity is that the Bermuda Triangle also happens to be between these latitudes.